Canon has released a firmware update for their EOS 6D DSLR camera. 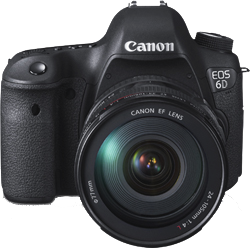 Fixes a phenomenon which prevents movie files shot using EOS 6D Digital SLR cameras from being played back on YouTube. Please follow the following workaround to help addresses the two scenarios described above. Shoot a video snapshot and create a video snapshot album. Import the captured video snapshot album to your computer. Select the video snapshot album, and select [Edit Movie] in the [Edit] tab. Select [Add Image] and select video snapshot album to add the movie snapshot. Select [Save] and [Save image type], and then click [Save]. Firmware Version 1.1.2 is for cameras with firmware version 1.0.9. If the camera's firmware is already Version 1.1.2, it is not necessary to update the firmware. You can download the new firmware updates from the canon website.